FOR the first time in 16 years, Stanthorpe has claimed the Miss Darling Downs title. Veterinary nurse and cattle stud owner Kahlia Williamson won the Miss Darling Downs Showgirl competition at the Royal Toowoomba Show on the weekend. 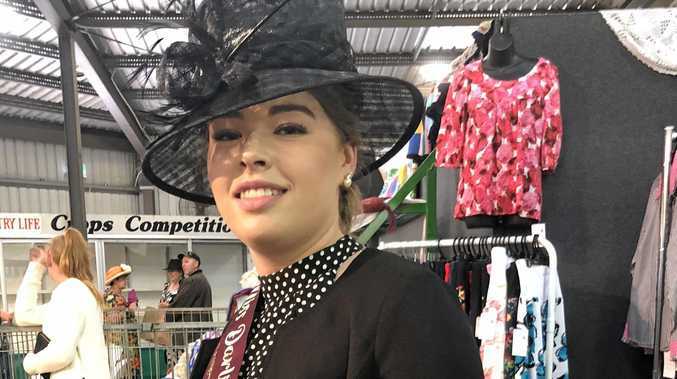 Kahlia's win means Stanthorpe will feature front and centre at Ekka, the Royal Queensland Show, where she will vie for Miss Queensland Showgirl in August. The 19-year-old competed with 13 other women for the title at the Toowoomba Royal Show, after taking out the Miss Stud Cattle award in the Stanthorpe Showgirl quest in January. Kahlia said the win was a "big surprise", and the weekend was one of the best in her life. "I've always been passionate about showgirls, I feel like it's a role model job," she said. "Also just to showcase Stanthorpe and the Darling Downs, what it has to offer." Stanthorpe Agricultural Show Society president Brett Boatfield said everyone at the Society was "so proud" of Kahlia. "It's brilliant... it is a big deal," he said. "There's a lot of pride and honour and respect who win and compete because they're representing our region." Kahlia is the first Stanthorpe winner of the Miss Darling Downs competition since Astrid-Jane Greenup in 2003. Representing women in agriculture runs in the family, with Kahlia's aunt Julieanne Williamson (Paget) from Stanthorpe winning the 1991 Miss Darling Downs title. Kahlia's mother Chris Williamson said she was "very proud". "She... wants to be a good ambassador for young women in agriculture and wants to inspire them to become involved in the industry and the show movement," Chris said. Kahlia also shared a win with her brother Adam when their limousin cow Miss Izz won Supreme Champion Female at the Toowoomba Royal Show. The pair have 30 stud cattle on the family property at Ballandean.